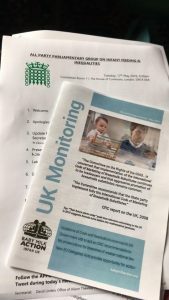 The All Party Parliamentary Group on Breastfeeding and Inequalities was set up by MP Alison Thewliss to address questions about breastfeeding and breastfeeding support in the UK. 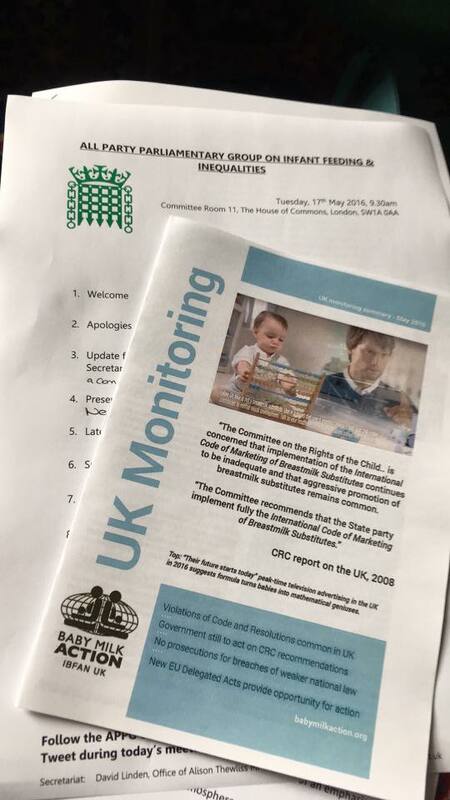 There was a fantastic turnout by all of the UK breastfeeding charities as well Healthcare Professionals, MPs and other breastfeeding advocates. Mike Brady gave a great presentation on the work of Baby Milk Action with clear and concise action points that are available right now to the government, as well as changes in the law that the government could be working towards. He examined marketing tactics carried out by the big name artificial baby milk manufacturing companies: nearly all of us in the breastfeeding world are aware of some of these, but Mike managed to find current staggering examples that we hadn’t heard of. The Baby Milk Action and Baby Feeding Law Group websites have more information. Helen Crawley from First Steps Nutrition joined Mike in the presentation and told us about the frustrations of not being able to access information about the composition of breastmilk substitutes currently on the market – as manufacturing companies are not obliged to share thisB information, they simply refuse to. Helen explained that the Department of Health has information on all breastmilk substitutes, but is also unwilling to share it . Maureen Minchin made a fantastic contribution to the meeting after Mike and Helen’s presentation. The discussion was energetic and included innovative ways to get the attention of MPs, as well as how to persuade breastmilk substitute companies to stick within the law. Maureen explained that, in Australia, MPs have used questions in their Houses of Parliament to name and shame companies. She also spelled out that we need to be aware of our language to slowly unpick the firmly rooted idea that breastmilk substitutes are unproblematic, that breastmilk is just that little bit better. For example, premature babies in NICUs are far less likely to get Necrotising Enterocolitis (NEC) when given human milk; instead of using this language, we could be talking about the far higher risks of babies getting NEC when given breastmilk substitutes. Maureen also argued the importance of using fortifiers that are not bovine based, as there has been a study that shows a strong correlation between premature babies receiving any bovine based substances and increased mortality. One of the midwives present talked about a recent situation where she had to deal with two aggressive and confrontational ‘formula reps’ coming into the hospital where she worked: they entered private areas in the maternity unit without prior approval or appointment, and even spent time one-to-one with the matron on the ward. Mike Brady reminded us about the film ‘Tigers’ which is the story of a ‘formula rep’ in Pakistan showing the huge pressure these representatives are under, not only to sell the formula, but also to set up and maintain strong links with local health care professionals. Mike showed a recent Nestle (which now owns SMA) recruitment advert for reps specifically aimed at growing their relations with health care professionals to support the growth of the SMA brand. The great news that the Royal College of Paediatricians has recently voted to no longer receive any funding from breastmilk substitute companies was mentioned; it is hoped that conversations with the Health Visiting profession will continue and that similar choices will be made. There was also discussion about strategies to provide the support mothers need – something which is at the heart of LLLI’s work – and plans for National Breastfeeding Celebration Week. Dr Amy Brown was present; she recently published research on ‘What Women Want’ and how to best provide support for breastfeeding mothers. We know that women who don’t receive support don’t continue to breastfeed and, therefore, how vital this is. The next meeting of the APPG will be held on Tuesday, 5 July 2016. LLLGB’s report on What Do Women Really Want?